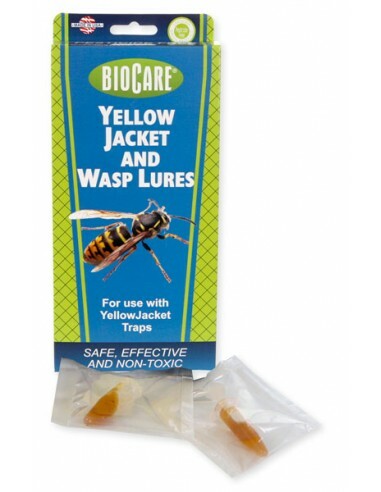 Yellowjacket and Wasp Lure is a naturally-based lure that works in any brand YellowJacket trap so you can protect your family from painful stings! Fill jar ½ full with water. Remove cap from lure and drop into liquid. Knot one end of hanger and slide through hole in lid. Secure lid to trap and hang trap securely or set on ground away from active nests. Wash trap and replace lure when full or every 2 weeks. Use a new lure each time. Do not place trap in dishwasher. Optional Directions: Add apple or pomegranate juice instead of water. Add 2 drops of liquid dish soap. AVOID USING CITRUS JUICES OR CITRUS SCENTED SOAP. Add a dime size portion of bait such as tuna fish, hamburger or cat food. Suggestions: Place trap about 10 fett from picnic areas or porch. Do not place trap near active nests as the insects will not stop at the trap on the way to the nest. Lure solution is effective for 10-14 days, or until the lure has no odor. When the trap becomes full, empty and wash out the trap with soap and water. Use a new lure each time the trap is cleaned. DO NOT PLACE TRAP IN DISHWASHER. Bees, Yellowjackets, Wasps, and most stinging pests. 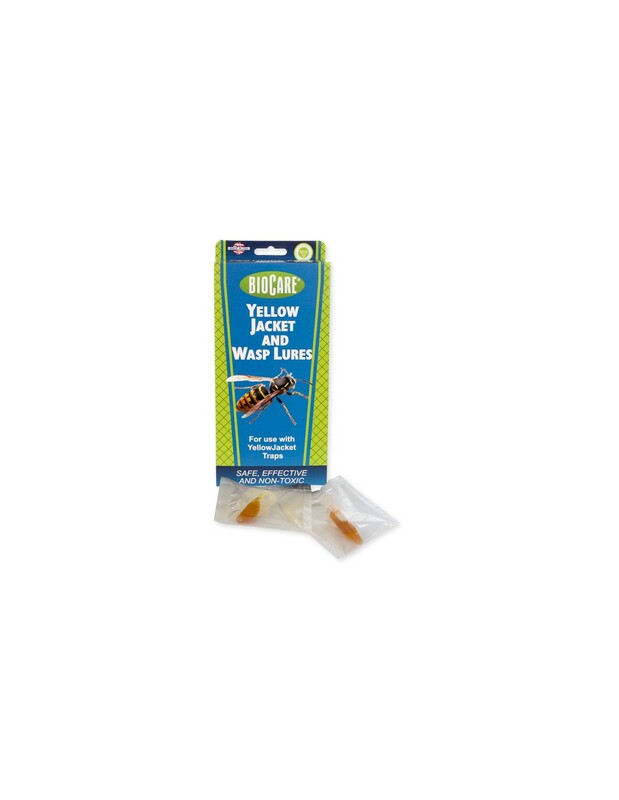 Yellowjacket and Wasp Lure Manufacturer: SpringStar Inc.